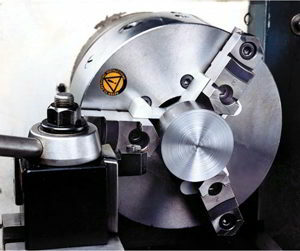 The Royal Chuck Stop provide a simple, consistent method for locating short parts in a three-jaw lathe chuck. The chuck stop enables short parts to project beyond the chuck jaws, providing clearance for facing operations. The Royal Chuck Stop is very accurate — front and rear locating surfaces are parallel within +/- 0.0004″. Because the Royal Chuck Stop eliminates the need to bore soft jaws, machine setup time is greatly reduced. The captive, web-shaped design of the Royal Chuck Stop eliminates the dangers of using spacers and parallels that could come loose and be thrown from a spinning chuck. 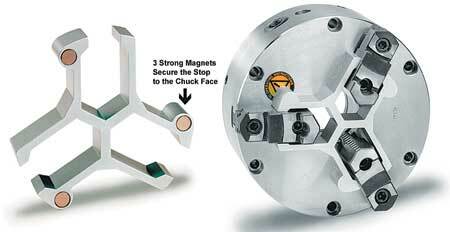 Three strong magnets further secure the stop to the chuck face. 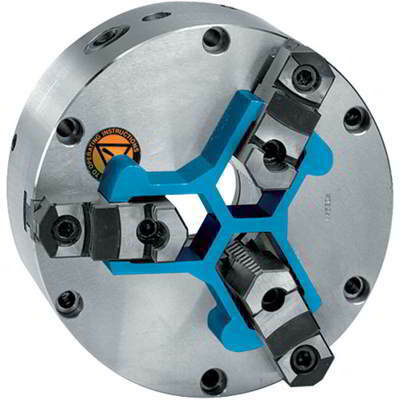 The Chuck Stop accommodates chuck jaws up to 55mm (2 1/8″) wide. Chuck Stop are available in 15-, 20-, 25-, 30- and 35-mm stops.